A local classic marks two decades with a cheese-drippy fundraiser. Mulberry Street Pizzeria celebrates its 20th anniversary on Wednesday, Oct. 3 with 20¢ slices at all three locations. All proceeds go to Team Fox. It is so rare, these days, that we get to pull out the ¢ sign, so when we do we always jump at the chance. And that there should be pizza involved, and a classic local pizza at that? We've got our cent-symbol finger at the ready. The holder of the cent sign on this happy occasion is Mulberry Street Pizzeria, which will be selling cheese slices for 20¢ on Wednesday, Oct. 3 at all four of its locations (Encino, Sherman Oaks, and the two in Beverly Hills, of course). The reason? 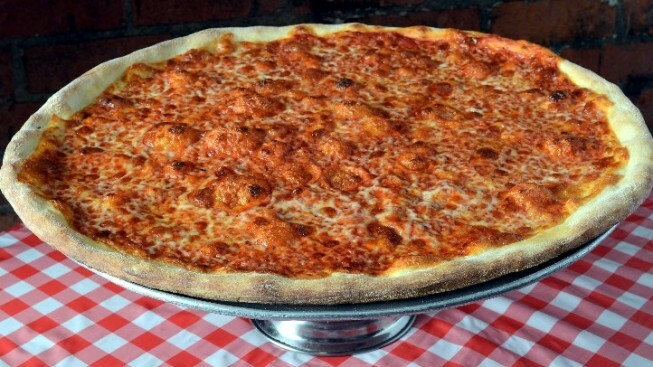 The pizza palace, known for its authentic New-York-i-ness, its red-and-white-checkered atmosphere, and its long, open counters (the better to eye the pies) is marking two decades in business. But there's one better: All proceeds from the day go to the Michael J. Fox Foundation for Parkinson's Research. Now, can you get only one slice? Yep, that's the rule; don't try for more, is all we're saying (we love the shops for their cheerful big-city attitudes, but you may find yourself getting a bit of the latter if you give guff and push for an extra slice at that price). But here's the thing: If you've been to a Mulberry Street Pizzeria, you know the slices are el grande. They're hefty. They have character. They're not some flimsy triangle. You can fold 'em. If you handed one to your friend he might pretend to drop it, the better to show it's a big'n and hard to put a hand around. One'll be fine for you. Happy anniversary, Mulberry Street Pizzeria. How many slices have people folded above a cheese-slicked paper plate while walking out of one of your shops? We'll guess the number, after twenty years, is in the hundreds of thousands.